Dr. K. David Harrison and Dr. Gregory Anderson presented at CSUN university on January 31st, 2012, in the Oviatt Presentation Room. 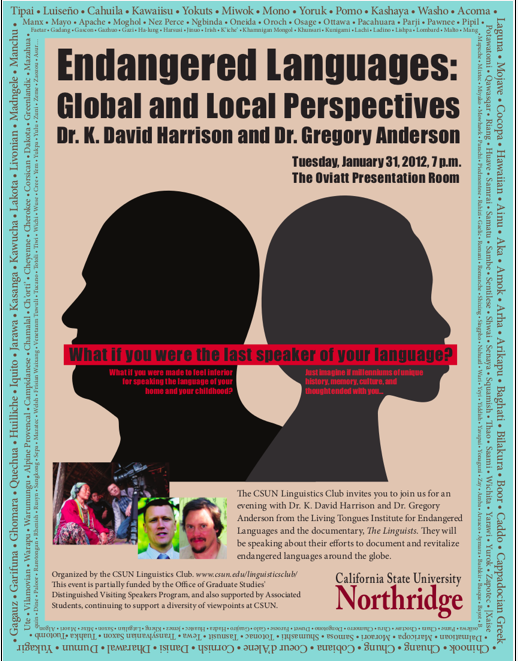 Many thanks to the CSUN Linguistics / TESL program for organizing this great event. Greg and David were pleased to meet the staff and students at CSUN, and engage in meaningful discussions with them. This entry was posted in Endangered Language Activism, K. David Harrison, Language Hotspots, Launches and Public Events, Media and Publicity, Support Endangered Languages and tagged California State University, Dr. Gregory D. S. Anderson, Dr. K. David Harrison, endangered languages, global and local perspectives, Language Hotspots, living tongues institute, Northridge, oregon, salem, The Linguists by livingtongues. Bookmark the permalink.